Is stupidity contagious? I dealt with 2 very stupid people this morning and now it seems that everything I do is getting messed up and I am zoning out. It has to have something to do with them! Most of you know I work as support staff in microbiology research. I have just “volunteered” to take on a new faculty member. Mostly because what he does is a bit different from my other faculty members, so it is nice to be working on something new. This morning I received a call from him. He said that the phone call he was receiving had a bunch of strange beeping and they were calling over and over again. I told him it sounds like a fax trying to get through and explained to him how to transfer the call to our fax machine. Soon after that he called us in the office and explained that he would be forwarding all his calls to me today and I could deal with them and page him if they were important. This hasn’t been typical thus far so I assumed the fax attempt really upset his day (as I know, it has happened to me more than once!) So, in interest of his sanity, and now mine since all his calls were forwarded to me, I decided to take a look at the fax and try to call the faxor (is that a word? faxor/faxee 😉 ) so that they could update their records. Sounds logical up to now right? Here is where it starts to get fun. The fax that I took out of the machine was patient information, and did not have anything to do with my faculty member, nor with any doc at our university. This was an insurance company looking to get more info to deny or approve someone’s claim. But keep in mind, it has NOTHING to do with us. So, here I am thinking I am doing the company a good deed by calling them and letting them know that the patient info did not get to the right place thus making it terribly difficult for the doc they are looking for to give additional information. I also want the patient to have her claim properly taken care of rather than falling into the abyss of a clerical error. Furthermore, I want to save myself a headache in the future. Finally I think that by doing this I am abiding by HIPAA guidelines, as no one wants patient info just floating around. So I call their 888 number. I get a rep on the line. I explain the situation and let her know why I am calling. I ask her to update her records. She says she needs a tax ID number. I say, I don’t have that to give you. She says, “Well I cannot update the records if I don’t have a tax ID number.” I ask, where on the paperwork would I find this? She tells me I should just know it. I explain that there is no way for me to know it as this is not something that should be coming to us. I tell her that I have all the patient information in my hot little hands and am more than willing to give her that so she can look up the patient and find out where this was supposed to go to. She does so. She then again asks me for the Tax ID. I again tell her that I do not have that info, as this fax was not supposed to come to us, and that the doc it looks like it is supposed to go to does not work here. I ask if there is someone else to speak to since I am going around in circles. She transfers me to a customer service rep. I am forced to again explain situation and literally “wash, rinse, repeat.” Now I am upset. I have spent probably 10 minutes on the phone at this point, trying to do THEM a favor and no one can understand what I am telling them. I do not raise my voice but I swear I start to talk sooooo fast when I am getting annoyed. So he asks me for the tax ID for the 5th time and tells me that if I don’t have it, perhaps I can call someone who does. I say to him “I do not know the tax ID, I can’t give you a tax ID, and if I did have a tax ID, it won’t help you because it came to a university that doesn’t have the doc it is supposed to go to, so our tax ID would not be their tax ID and won’t help you update their database. I do have ALL the patient information, look it up that way.” Response? “I cannot update our database without a tax ID.” *sigh* “OK” I say, “Look, I am trying to do you a favor, and the patient a favor. If you don’t want to try to help me that is fine. Please take a note that this patient’s info did not get to where it was supposed to go. Perhaps someone from your end can look up where it is supposed to go because I really don’t think that is my responsibility, as this was not ever supposed to get to me in the first place. All I am trying to do is let you know that you have a wrong number.” He says “Well, you may get the call again, since you won’t give me the tax ID number.” *deep sigh* Whatever, I have already wasted 20 minutes of my morning trying to do a good deed and save myself some heartache. If they don’t want to listen, there isn’t much I can do about it. I hung up. I hung up to the uproarious laughter of my coworkers who were apprentely enjoying their morning entertainment very much. They thought it amazing that I didn’t raise my voice. I assure you this guy knew how angry and frustrated I was getting even without raising my voice! Yes, I am way behind. I just haven’t had the time. Clue 4 is out and I have only just finished clue 2. Not to mention how long clue 4 will be when I get there! It is ok though, it is supremely rewarding even so! 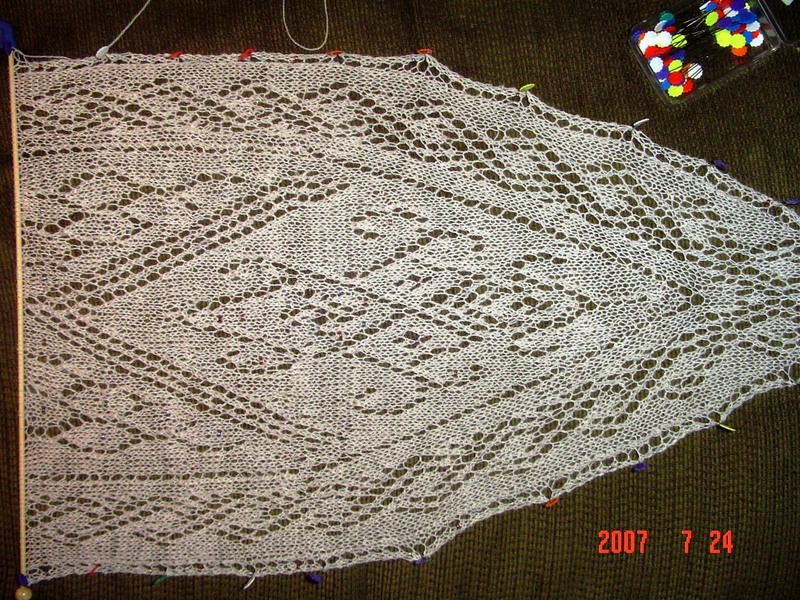 Love the pattern so far, love the beading, can’t wait to find out what the theme is, any guesses? I have so much to write about, but somehow I haven’t had the urge. Strange for me! Perhaps I’ll start with a school update. I had my advising appointment yesterday morning. I went in and my adviser had not looked over my information. She said that perhaps I was in the wrong place since all my transferred credits were music oriented. I assured her that indeed I had no intention of studying music. She looked over my transferred credits and set me up with classes that would fill the university requirements as well as the requirements of my intended major. I think this is wise in case I have a mind to switch eventually. I am set up to start with an English Lit course that meets only on Wednesday evenings. I think that will be something I can more than handle! Now I just want to get started. I then took a look to see what credits actually transferred. ALL of them!!! I had no idea that would happen. So I get to start with 41 credits, as a sophomore. I am pleased with that as well. On to the revelation part of this post. Somehow for the last 10 years, I have had it in my head that I am a terrible student. That I can’t study, that I don’t do well in college, and that it isn’t worth my time. Imagine my surprise when I saw that I got mostly A’s and B’s with a smattering of C’s here and there! To be honest, I was floored. How could it be for the last 10 years I have been thinking that I was a poor student? This is not the transcript of a poor student. Not the best either, but not poor. I honestly believe this comes from the difference in being able to pass, and comprehension. Somehow I knew while I was learning these things that I wasn’t comprehending them fully. So when I stopped college, I assumed that meant I was a bad student and just didn’t look back! So now I am stuck rethinking what I have been sure of for the last 10 years regarding school. I’ve been tagged by Put a Sock in it! and for a brand new (to me) one, I bring you Savasana! Really you are free to do it or not, whichever you prefer. This is the first I have done, though I suppose this means I should go back and do the one GreekGeek tagged me on otherwise I would just feel guilty! This one appeals mostly because it has structure, and I need structure! I was busy quitting college. I had gone for music education on the Viola. I quit for various reasons. Not enough money, hand pain from repetitive motion injury, the knowledge that I was not in the right major for me, the love of catering and the desire to take time off and try something new. At that time, it was a very wise decision. I just wished I had gone back to school sooner! In July 2006 I was celebrating the 2nd birthday of my lovely daughter. Also going through a VERY messy divorce which had me insecure and panicky. 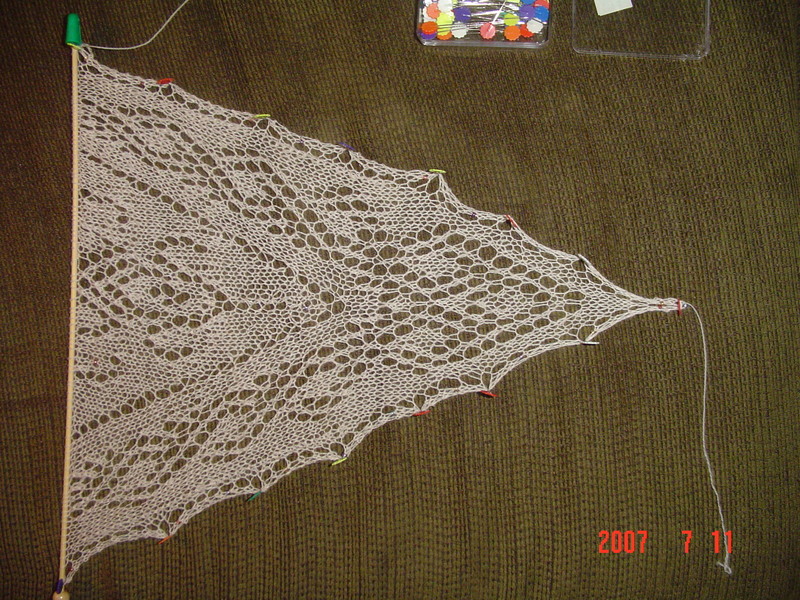 But in July 2006, I was really starting to make some progress! Nail biting, but honestly this is under control when I knit. Too bad I can’t knit while I drive! Reading or listening to recorded books. Listening to my little girl talk! So, I wanted to attempt a short row heel. I also wanted to try self striping sock yarn. Here is my initial attempt at both. short row heels need some practice. Stripey yarn is cool. 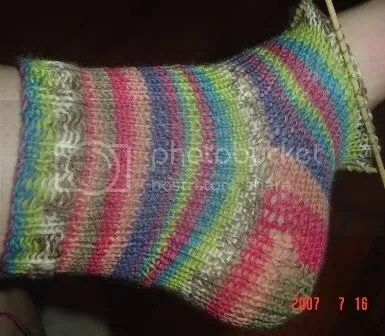 Now my daughter says “mommy, will you do some stripe socks with your knitting for me?” So I need to find some children’s sock patterns! So….I had placement exams this weekend. The math exam went just as expected. Any answer I gave was a guess at best. I never was able to understand math and it has now been 13 yrs since I have attempted it. So I didn’t expect to be able to manage the test. On the other hand, the remedial courses I will have to take at the local community college should give me a good solid basis of understand for whatever math might be required of me. I am ok with that. The English exam, on the other hand, went better than expected. I think I did well and I was highly motivated to do well as I want to place out of certain classes and into ones which will capture my attention. I was the last one to leave after the essay portion. All the “kids” I was testing with left quite a bit earlier. But I remember being that age, and placement exams were something to get through, not do well in. I wanted to do well and give the reader something to think about too. I had fun with it! The most interesting part about the entire process is how different I test now than I did at 18. There are things that come naturally for me via years of experience, that I wasn’t capable of at that age. For one, my focus is different. I am more focused. I don’t get bothered by every extraneous noise from various parts of the room. I do things in an organized fashion rather than haphazardly. This is greatly encouraging to me as these were some of my biggest worries about going back to school. So all in all I was pleased with the outcome and am looking forward to seeing the results next week! So, some talk about being bit by the sock bug. That didn’t bite too hard, I like making socks, but simply because they are portable and make a good work project. I don’t get a thrill out of them though. The lace bug, on the other hand, has bit hard! Here is MS3 second time around. I am MUCH happier with it this time. Can you see the beads? Not well I don’t think but they are purdy!